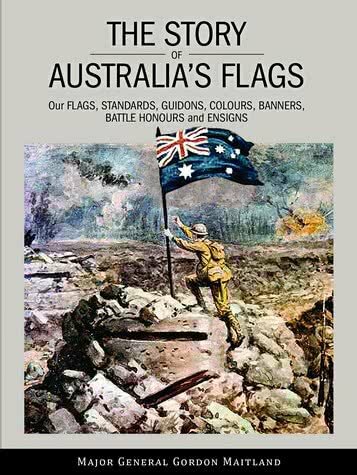 This morning I had the honour of attending the official launch of Major General Gordon Maitland’s book ‘The Story of Australia’s Flags which was hosted by the Department of Veterans Affairs in Sydney. It follow on from his previous publication ‘Honours and Awards of the Australian Army. Both are published by Playbill Military Productions and are essential references to anybody with an interest in the customs and traditions of our Australian military forces. ‘Australians formally announce themselves by flying our flag or singing our National Anthem. ‘Sometimes we may do so more informally by flying a flag bearing an image of one of our unique fauna or by singing Waltzing Matilda. ‘Another favourite song is: ‘We are one, but we are many, and from all the lands on Earth we come, we share a dream and sing with one voice – I am, you are, we are Australian’. It was written by Bruce Woodley and Dobe Newton in 1987 and is owned by Telstra. I am biased and would prefer ‘flag’ to ‘dream’. I honour my God; I serve my King; I salute my flag. 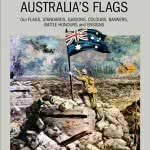 ‘However this book is about the formal side of our flag flying and is dedicated to all who are proud to be an Australian and have taken the spirit from our flag. ‘During the 1990s two new domestic campaigns emerged, one claiming that Australians needed to establish their identity, and the other pressing for a new flag to exclude the Union Jack[i]. Ex-service people in particular were quick to point out that they had always known who they were and, whom they were fighting for; furthermore they strongly resented the move to change the flag under which they had fought and under which, when possible, they were buried. ‘I can clearly recall my emotions when ships of the RAN entered Bima Harbour in the Sunda Islands to initiated the 1945 surrender arrangements. The ships were in line abreast with the crews at action stations and the billowing Australian National Flags and White Ensigns gave rise to immense pride in the way that Australia had acquitted itself in those six years of war. 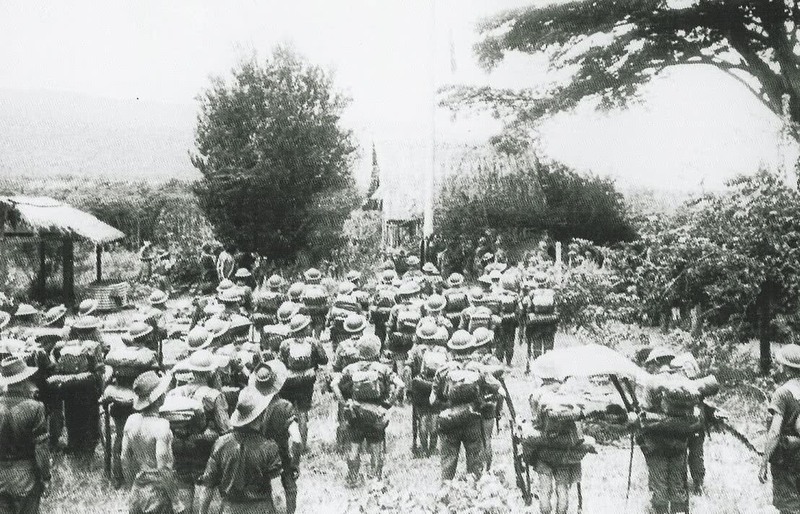 Its relatively small volunteer army had defeated the professional armies of Italy, Germany, Vichy France and Japan; it had lived up to the traditions set by the Anzacs. In doing so, its people had kept faith with their forebears, who had shown such great fortitude in leaving their homeland and forging a nation and a people capable of such performance. Who gave modern Australia’s birth. And shed of their blood for OUR FLAG. During the debate in the 1990s former Prime Minister Paul Keating was reported as saying that Australians had never fought under the Australian flag. It’s a pity he did not have access to Major General Maitland’s book then because he would have seen Australian War Memorial images of Lieutenant Arthur Hull planting the Australian flag on top of a German concrete blockhouse during the battle of Menin Road on 20 September 1917 and a photo of Major General Vasey raising the Australian flag at Kokoda on 3 November 1942. He would also have seen an image of the Changi flag now held at the Australian War Memorial. ‘When I went to school I saluted the Australian flag. When I went to war I fought under it. When I die I want to be buried under it. But if you change it – forget it’. Twitter-happy chardonnay warriors who have never worn the uniform might like to keep his words in mind before they seek to destroy the most important national symbol for our veterans during the dark days of WW1 and WW11. Major General Maitland has made an invaluable contribution towards recording our flags, standards, guidons, colours, banners, battle honours and ensigns. [i] Jack: Originally a national flag that was flown from the jack staff at the bow of a ship. Through custom, the Union Flag of the United Kingdom came to be known as the Union Jack.